To the disability of being unable to speak his mind in public Suleiman Kerimov has the added handicap of being unable to accept how short his arms are, particularly when handling money from state banks. In overreaching himself Kerimov has provided a case study of how President Vladimir Putin expects the Russian oligarchy to conduct its business when state interests are at stake; and also of the continuing importance of former deputy prime minister Igor Sechin, now chief executive of the Rosneft oil company. In July Kerimov got too big for his boots when he believed he had Kremlin support for upsetting the potash cartel known as the Belarusian Potash Company (BPC), directly threatening President Alexander Lukashenko of Belarus. The BPC, headquartered in Minsk since 2005, was a Russian creation — successor to a line of trading organizations for the concealment of potash sale profits with names like Ferchimex (Belgium), Bermont (Switzerland), Fertexim (Cyprus), and Uralkali Trading (Switzerland). All of them were the creation of the fertilizer, I mean fertile, mind of Dmitry Rybolovlev, whom Sechin drove out of the potash business in 2010, replacing him with Kerimov. 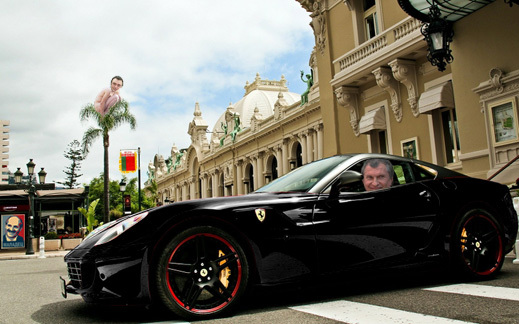 Sechin failed to oust Rybolovlev’s trader, Oleg Petrov, who stayed on to teach Kerimov the tricks of the trade. Financed by the state banks, and exercising apparent control of the potash monopoly Uralkali, Kerimov believed it would be more profitable for himself if he disposed of BPC, much as Rybolovlev and Petrov had done in the past to Bermont and Fertimex, and run his potash sale revenues through Uralkali Trading – without having to share them with the Belaruskali, the 50/50 partner in BPC. Kerimov, according to a friend, thought he had the backing of Arkady Dvorkovich, a deputy prime minister of Russia whose boots have also been illusorily large, at least until now. There was also nodding support from Dmitry Medvedev, a prime minister whose boots have never been smaller. In the outcome, believing he had a green light from Putin, and with a nod from Sechin, Lukashenko got the drop on Uralkali’s chief executive, Vladislav Baumgertner, luring him to Minsk with an invitation from the Belarus prime minister, Mikhail Myasnikovich, and then placing him under arrest. That was on August 26. Kerimov was reportedly on vacation and asked Baumgertner to go in his stead, take notes, say little, and report back; Kerimov had been in Minsk himself to see Lukashenko in December of 2012 and in May of this year. In the potash business Baumgertner is subordinate to Kerimov as the representative of the owners; he is also subordinate to Petrov for managing the cashflow. Baumgertner is also a soft fellow. He had already learned to volunteer swift confessions when Rybolovlev was the boss of Uralkali. Details of Baumgertner’s latest confession, extracted from interrogations at a Minsk prison over the past two weeks, have now been conveyed to Putin. Putin’s only public comment since Baumgertner’s arrest has been to call for the evidence substantiating the Belarus charges. In private, Putin authorized Sechin to get rid of Kerimov, and find a new Russian buyer for his shares, who will run Uralkali more to Lukashenko’s liking, and Putin’s and Sechin’s, too. The Russian media have been leaking the names of replacement candidates, including those who don’t want the job and others who have yet to be approved for the state bank loan required to pay Kerimov out. The outcome won’t be a return to the status quo ante. It won’t be a takeover of Belaruskali either. The restoration of cartel arrangements for restoring the potash price will follow, but a new team will supervise the cashflow. Whether Dvorkovich will follow Kerimov into the wilderness, as Sechin is trying to arrange, isn’t certain. Petrov is the target of the Belarusians because he has been the head of the potash sales operation for longer than anyone else at Uralkali. Petrov graduated from the Moscow Military Institute in 1989 with a degree in Portuguese and English. In 1998, he took an economics degree from Plekhanov Academy of Economics. 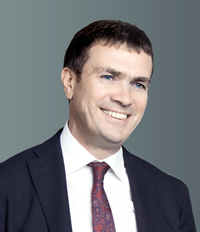 He has been a board member of BPC, and also head of sales and marketing at Uralkali. Solodovnikov has worked under Petrov and was in charge of sales at BPC. The list of their names and titles reveals that the immediate target of Lukashenko has been the shaving of price between the sum received by the producer Belaruskali and the sum paid by the buyer, and the diversion of cash during BPC’s shipping process. How the scheme was hidden is plain from the interim financial report of Uralkali for the first half of 2007, issued by PriceWaterhouseCoopers (PwC) on June 30, 2007. “In October 2005, Uralkali acquired a 50% interest in Belorussian Potash Company (BPC), the remaining 50% of which is owned by Belaruskali. The principal activity of BPC is marketing and exporting as agent [of] potash fertilizers produced by its two participants. The BPC charter provides for separate accounting of the operations of each participant, including separate accounting for the sales of the participants’ goods and related cost of sale and distribution costs. Administrative expenses incurred by BPC are shared 50:50. Distribution of net income to each participant is on the basis of their relevant results, after administrative costs unless both participants decide not to distribute. Operations of the Company through BPC are accounted as a jointly controlled operation.The statement of income reflects the revenue from sales by BPC of Uralkali’s products, together with the related costs of sale and distribution and administrative costs.” The clue to the scheme is the acknowledgement of “separate accounting” — see Note 9, page 13. In his presentation of Uralkali’s results this week, Petrov defended the break with BPC on the claim that only the Belarussians, not the Russians, had been engaged in “separate” trading and “separate” sales negotiations. The evidence that BPC is an agent with parallel but separate profit accounts, and non-consolidated financials, appears to be clear; western perceptions of BPC as proprietor and principal in the potash trade have been mistaken from the start. In this context, the highly publicized potash price, which BPC has claimed to be negotiating with buyers in China, India, and Brazil, was a benchmark. It was never the real price of sale and delivery. In other words, it was a reference price, before discounting took place between actual sellers (Belaruskali and Uralkali) and buyers (such as the Indian Potash Company). As for the chargeback price, which was the one recorded on the revenue line in Uralkali’s published accounts, that was different again, arrived at only after the trading schemes had done their magic. Two fictional numbers then, the reference price and the chargeback price, drove the share price of Uralkali during the potash boom years until the crash of late 2008, before Rybolovlev sold out. Trading methods, such as transfer pricing, tax minimization, dividend shelter, address commissions, kickbacks, and related corporate schemes – were built into the business behind the BPC façade. The Uralkali auditor PwC was not privy to the full financials of BPC, and was obliged to accept the BPC-derived data for Uralkali’s “share” of revenues, costs, etc., without looking behind these data. As auditors of Russian corporations go, PwC auditors are not known to have required arm-twisting to investigate as little as they have done. What the Belarus indictments now reveal is that BPC was never a business corporation in the conventional western sense. It has been an agent , legally closed, and controlled in every respect by its two stakeholders, who concealed their own operations and accounts from each other. Lukashenko and his prosecutors are now accusing the Russians by name of chiselling and cheating on every tonne of BPC potash shipped for the past seven years. That’s more than 80 million tonnes — the BPC archive only reports annual shipments for 2011 and 2012; the tonnage for 2006-2010 must be estimated from press reports and interviews with BPC sources. What Sechin intended and Lukashenko has done is to eliminate Kerimov as the beneficiary of the Petrov schemes. 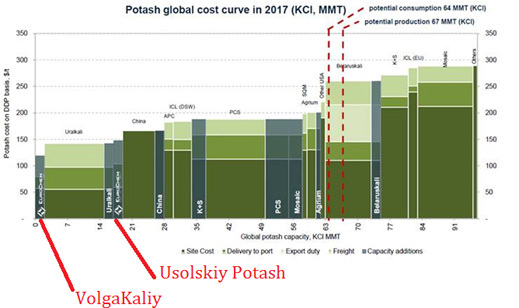 But sources aren’t sure whether Uralkali’s move to attack the global potash price and dominate the global market for potash by itself was Kerimov’s alone. Accordingly, they say they aren’t able to predict what Putin and Lukashenko will decide to do for the future market share they want to take, and what potash price they want to set in order to reinforce their dominance and put competitors at home, in Europe, and in North America out of business. A new deal between Minsk and Moscow will hinge on what the real cost of production for potash is at the minehead, and how long Uralkali and Belaruskali can tolerate a market price of under $300 per tonne. In May of 2013 a Russian rival of Uralkali’s, Eurochem owned by Andrei Melnichenko, gave a presentation to international investment funds which included this tabulation of what Eurochem claimed to be the cost of production of potash at its two new Russian mines; at Uralkali and Belaruskali; and at the major international potash producers. Sources who have studied the tabulation take it, they say, with more than a grain of salt. They suspect all the potash producers of contriving cost figures, including the mine, transportation, tax and duty numbers, to exaggerate their competitive position. Even if the numbers are artificially low, the magnitudes of the comparison may be indicative. They suggest that Uralkali can produce and sell potash at about $100 per tonne, or 67% below Belaruskali. In presenting its financial results this week, Uralkali says it intends to exploit that advantage, and if necessary drive Belaruskali out of the market, along with everyone else with higher costs. “The Company believes that in the current market environment the optimal value-creating strategy is revenue maximisation. Uralkali has a number of competitive advantages including the lowest production costs in the industry, ability to increase capacity on the most efficient basis and favourable logistical routes. We believe the potential for strong returns maintains the company in a position of industry leadership.” Uralkali claims that in domestic sales during the first six months of this year its potash fetched an average price of $257 per tonne, while its exports averaged $316. At his Rosneft office, Sechin was asked whether he has a view about the evidence in the prosecution by the Belarus Investigation Committee, and a view about how to organize the future of the Belarus-Russia relationship in potash. Rosneft confirms that Sechin’s spokesman, Andrei Knutov, had the questions on his desk. There has been no reply. Recombining the two BPC companies, as Sechin is now trying to arrange and as Putin and Lukashenko want to achieve, will require an entirely new scheme for pricing and profit-sharing. This is bound to cost the Russian side a bigger share of the potash profit pot than Rybolovlev, Kerimov or Petrov were willing to concede. That may be financed as a state subsidy for Belarus so long as Putin and Lukashenko agree to hold the market price of potash down in order to take market share from the Americans. That’s a strategic enterprise which they can hardly carry off by themselves. They will need Chinese help.